I’ve recently become aware that many popular ice cream brands contain additives and fillers. Rather than simple ingredients such as milk, cream, and sugar, many ice creams contain ingredients such as guar gum, locust bean gum, carob bean gum, xanthan gum, soy lecithin, mono and diglycerides, and carageenan. Aldi’s Regular Buy Belmont ice cream, which sells for $2.89 at my local store and includes flavors such as Moose Tracks and Cookies and Cream, contains some of these additives, so I decided to try Aldi’s Regular Buy Specially Selected Super Premium Vanilla Ice Cream that costs $4.19 at my store (Aldi recently raised the price, up from $3.89 previously). For $1.30 more, I avoid all those additives. 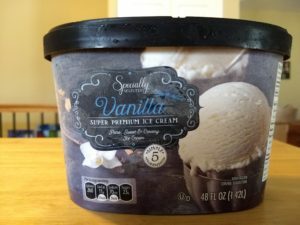 The Specially Selected vanilla ice cream carton states it contains “5 simple ingredients.” The Specially Selected brand also comes in chocolate. For our purposes today, I’m just looking at the vanilla flavor. One of the big questions, of course, is how Aldi’s higher-end vanilla ice cream compares to name brand ice cream such as Breyers Natural Vanilla Ice Cream. 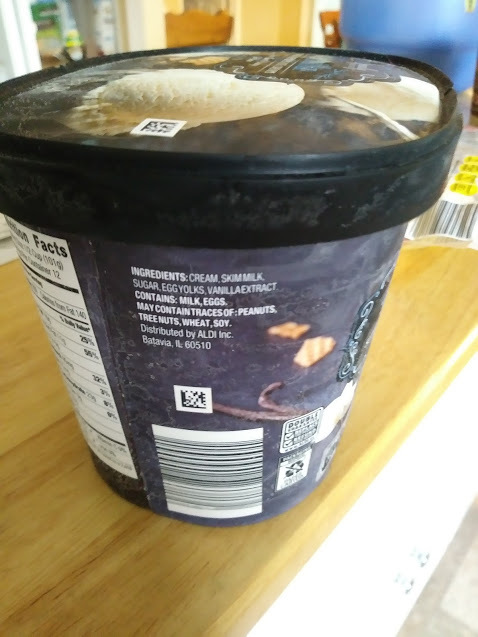 From an ingredients perspective, the Aldi ice cream is the winner because it contains only whole, easily identifiable ingredients. The Breyers ice cream contains an additive called tara gum, which apparently replaces much of the healthy fat in ice cream and also gives the ice cream a smoother and creamier texture. 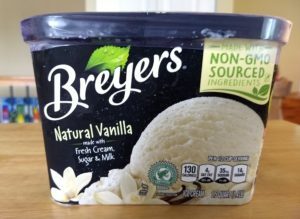 I also noticed the Breyers ice cream, while containing tara gum, is packed in a carton that features prominent graphics stating that it’s made with “fresh cream, sugar, and milk” and that it’s made with non-GMO sourced ingredients, with Rainforest Alliance Certified vanilla. The milk and cream are from cows that were not treated with artificial growth hormones. The dairy products are “all American” and “colors and flavors come from natural sources.” The carton also says the vanilla (and fruit, in the case of other Breyers flavors) are real and are sustainably farmed. It’s a lot of health boasting for a product that contains an indigestible gum ingredient. The Aldi ice cream carton, meanwhile, emphasizes that it has those “5 simple ingredients.” There seems to be a lot to like about that. So, how do the Aldi ice cream and the Breyers ice cream taste? Aldi’s Specially Selected Super Premium Vanilla Ice Cream is at the top of this photo. Breyers Natural Vanilla Ice Cream is at the bottom. 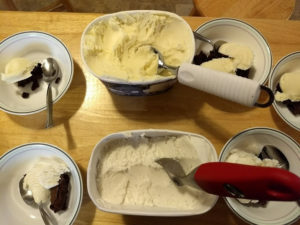 In a blind taste test (we ate our ice cream atop brownies made from a mix purchased at Aldi), my two children preferred the Breyers. I also liked the Breyers best, but my husband preferred the Aldi ice cream. 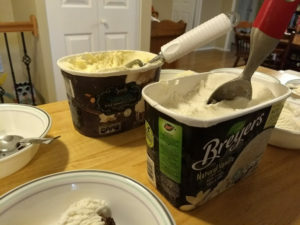 My children and I liked the texture of the Breyers because it was smoother and creamier. My husband preferred the flavor of the Aldi ice cream, despite the fact that the texture wasn’t as smooth. It turns out, my daughters and I were noticing the tara gum in the Breyers brand, which gives ice cream a texture that is smoother than it normally would be. Breyers states that customers prefer this newer formulation in taste tests, but that may be because so many of us have little experience with real homemade ice cream. So, three fourths of our household preferred the Breyers simply from a taste/texture perspective, and one fourth of our household went with the Aldi ice cream. 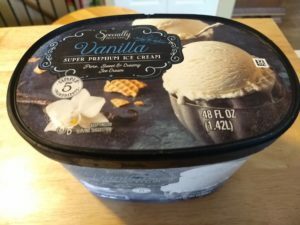 In terms of cost, if you buy name brand Breyers Natural Vanilla Ice Cream during a good sale, you can purchase it for less money than Aldi’s Specially Selected Super Premium Vanilla Ice Cream. If the Breyers brand isn’t on sale, though, it’s a better deal cost-wise to buy the Aldi ice cream because it costs about $1.50 less. In terms of taste, during a blind taste test, most (but not all) of my family preferred the Breyers ice cream over Aldi’s ice cream. The Breyers ice cream was smoother and creamier, but unfortunately a little internet research indicates that smoother texture is because Breyers adds tara gum, a vegetable gum, to its ice cream these days. On the other hand, the Aldi ice cream is made with only whole, natural ingredients: just skim milk, cream, sugar, egg yolks, and vanilla. That’s it. The Aldi ice cream has significantly more calories, fat, sodium, and sugar than the Breyers, but it’s real food. It’s ice cream the way our grandparents or great-grandparents would have made it at home back in the day. I’m a bit torn. The Breyers ice cream tasted great, but I don’t like knowing that the taste and texture are, in large part, due to a vegetable gum additive. I respect Aldi for carrying a product that contains only real, whole food ingredients. For that reason, I am seriously considering sticking with Aldi when it comes to ice cream. It’s probably the next best thing if you don’t have an ice cream machine for home use. Props to Aldi for having an all-natural ice cream! The fact that it is higher in fat and calories is a good thing to me. If I am having a dessert, I want it to TASTE GOOD. Fat makes ice cream taste good. If I want to consume fewer calories, I will simply skip dessert. Skipping dessert is far preferable to eating a lower calorie disgusting garbage “frozen dessert.” Breyer’s (and Ben and Jerry’s) used to be soooo good but now they are awful. I agree. I hate dairy dessert!!!! It’s not ice cream… if I want air… I’ll breathe… not eat ice cream! Jen I agree with you 100%. Breyers used to make good ice cream but not anymore. You can call Breyers dessert ,but not ice cream. The new Breyer’s ruined a “classic” but Aldi’s — minus the vanilla bean specks — restores for those of us of a certain age, the classic product quite well! Just bought the Aldi super premium vanilla and their chocolate too. There is no doubt Aldi has the better product. Breyers is garbage since the mega-conglomerate Unilever acquired it and cheapened it up. I can tell Aldi is not blown full of air because it freezes hard and the quality is right on the ingredient list. A great product at a fair price. While gum is not healthy, artificial growth hormones and other GMO ingredients are far more dangerous to your health than gum. Agee with others above. = Important! Read the weight in grams per serving and u will be shocked at how much air is whipped into most (including Breyers) ice cream – Except for Aldi Super Premium . It weighs 101 grams per half cup. That partially accounts for the higher calories . Some people like the airy taste. But not me. I only buy Aldi Super P. vanilla – then add cocoa and/or natural peanut butter or cinnamon or crushed graham cracker or molasses or ???? Density is what matters, not the ‘1/2 cup’ serving, or rather the mass in that half cup. Breyers, Aldi’s lower end Belmont, and most ice creams whip a ton of air into the mix, meaning that you can eat a huge amount and not feel full. But just a little of the good stuff will be satisfying. Have not yet tried Aldi premium. The best deal on premium used to be Kirkland at Costco, then they kept raising the price, then they stopped making it as Kirkland brand. Now it’s like 14.39 per gallon. The Aldi is a better deal, 11 something per gallon. Another good sprinkling on vanilla is a bit of instant coffee (if you like coffee ice cream). i love Aldi butter pecan. ice cream is not a diet product..it’s either good or it’s not.. dieters? eat less if you can..! I looked long and hard to find a quality ice cream product without a gum type additive. Aldi ice cream is the real deal, love this quality product. If you leave Breyers or other products with, a gum type additive, at room temperature for a few minutes, you end up with a gummy mess. My only suggestion, I wish you would produce a lactose free version so my grandson could enjoy your product. From. A very satisfied customer.